Steve Rintoul: My project is looking at the Southern Ocean with an emphasis on observations of the Southern Ocean and we’re targeting a few different things. One is changes in the deep ocean. We’ve found some of the strongest signals of change anywhere in the deep ocean in the waters around Antarctica and we really need to understand why. What does it mean? What are the implications of that and why is it happening? And one way we’ll do that is through ships, the traditional way that we have of measuring the deepest parts of the ocean, but we’ll also be deploying the first pilot arrays of something called deep Argo floats. These are profiling floats that can work through the whole ocean depth. Eighty percent of the Southern Hemisphere is covered by oceans and they’ve been largely unmeasured and poorly understood. That’s beginning to change, and we can use that new information to develop new insights into how the Southern Hemisphere oceans work and how they affect regional and global climate. This project will achieve two things. One it will allow us to better understand how and why the deep ocean is changing and two how changes in the Southern Ocean will affect the Antarctic ice sheet where the waters interact with the floating ice around the edge of Antarctica. The project will collect new physical and biogeochemical observations in the Southern Ocean and use them with the historical record to develop a better physical understanding of the sensitivity of circulation and water mass formation to changes in forcing. 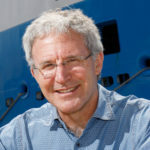 The overall objective of the project is to quantify variability and trends in ocean circulation and water mass formation in the Australian sector of the Southern Ocean, using a combination of shipboard data, float observations and satellite data, and to identify the physical mechanisms driving change. In a recent Nature article, Rintoul et al. present two narratives on the future of Antarctica and the Southern Ocean, from the perspective of an observer looking back from 2070. Read the CSHOR post, which includes a link to the full article, at this link. This Nature review by Dr Steve Rintoul evaluates the published research on Southern Ocean change: including changes in circulation, stronger winds, and increased freshwater input. The Southern Ocean exerts a disproportionate and profound influence on global ocean currents, climate, biogeochemical cycles, and sea level rise. The paper shows that substantial progress has been made in recent years in understanding the dynamics and global influence of the Southern Ocean. It is becoming clear that local scale processes play a fundamental part in shaping large-scale circulation. This is drive by the local topography which, of course, doesn’t change to a significant degree. Read the full article at this link. The results from a study published in Science Advances, and reported in a recent Guardian article, suggest that increased glacial meltwater input in a warming climate will both reduce Antarctic Bottom Water formation and trigger increased mass loss from the Antarctic Ice Sheet, with consequences for the global overturning circulation and sea level rise. CSHOR is one of several organisations supporting the research and is duly acknowledged by the authors of the paper. The figure below is an extract from the Science Advances paper. 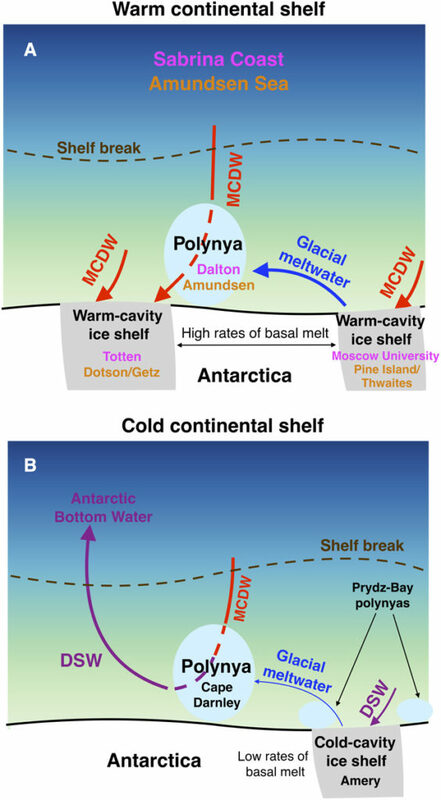 Figure: Impact of glacial meltwater on dense water formation and shelf stratification. Lambelet, M., Tina van de Flierdt, Edward C V Butler, Andrew R Bowie, Steve R Rintoul, Ros J Watson, Tom Remenyi, Delphine Lannuzel, Mark Warner, Laura F Robinson, Helen C Bostock and Louisa I Bradtmiller (2018). The Neodynium isotope fingerprint of Adélie Coast Bottom Water. Geophysical Research Letters, 45(20), 11,247-211,256. https://doi.org/10.1029/2018GL080074. Langlais, C. E., Lenton, A., Matear, R., Monselesan, D., Legrésy, B., Cougnon, E., & Rintoul, S. (2017). Stationary Rossby waves dominate subduction of anthropogenic carbon in the Southern Ocean. Scientific Reports, 7(1), 17076. https://doi.org/10.1038/s41598-017-17292-3.